A marshy village in Thua Thien – Hue Province has become a new tourist attraction with admirers saying its scenic beauty and cuisine offer something different from the usual. Phuoc Buu pays a visit, and is enthralled as well. There are sunsets and there are sunrises. And there are sunsets and sunrises in Chuon village, villagers will tell you, and there are some visitors who'll back them. The village, which sits astride a lagoon 7km from Hue City centre, becomes a magical place at dawn and sundown, people say. It can be said to an extent that this aspect of the village had not received any particular attention for centuries, and it is the advent of popular photography and a trend among urban dwellers to seek hideaways that have pushed it into the travel limelight. With word of mouth taking wing in recent years, visitors flocking to the marshy village have enjoyed the spectacular sights, and, whether it is hype or not, wondered about the sheer variety of hues on display in the sky – shades of purple, green, yellow, blue and red, combining in such a variety of ways that each sunrise and sunset stands out on its own. "This is my favourite place in Hue," said Le Anh Vu, a freelance photographer based in neighbouring Da Nang City. "Certainly, I've heard about it's new-found fame, but I don't come for it. The light here is amazing for shooting. "The light during dawns or sunsets here inspires me, and the vast area of the lagoon also gives much room for creative photography." Vu also said that the magnificent dawns are not the only sights that motivate shooting trips to the village. He and many other colleagues are also attracted by the peaceful, easygoing lifestyle of the fishermen. 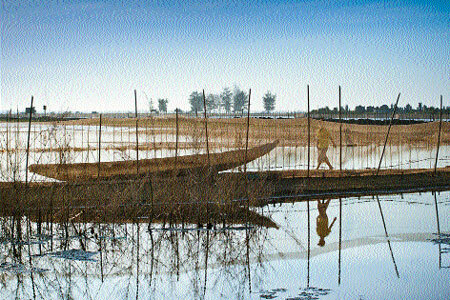 The fishermen also engage in aquaculture in the lagoon, and have created ponds by fencing areas with bamboo-knit palisades. These also create special views for visitors as they take boat trips that weave between the rows of palisades, or even watching the sunbeams filtered through the bamboo sticks. Photos taken in the village often focus on that point in the horizon where the sky and the earth meet, and what lies in between, be it the breeding ponds or the vast, peaceful stretch of water, adds to the beauty. The marsh of Chuon and the bordering Sam are part of the 5,200ha Tam Giang Lagoon, which runs 27km along Thua Thien – Hue coastline. It is Southeast Asia's biggest lagoon and the buffer zone for water from the province's three biggest rivers – Huong, Bo and O Lau before they flow on to the ocean. 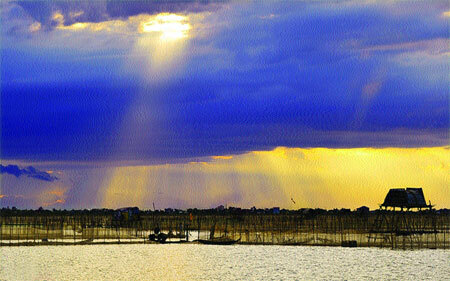 The huge lake stretches over the five districts of Phong Dien, Quang Dien, Huong Tra, Phu Vang, and Phu Loc. It is home to 230 fish species and 63 species of crustaceans. "For around four years now, many people have been coming here to relax, including residents of Hue and visitors from elsewhere. 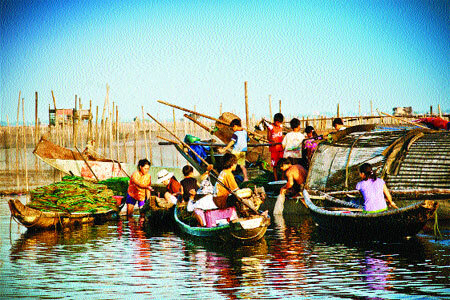 The marsh and the village weren't noticed much earlier," said Tran Minh Phuong, a 33-year-old resident of Chuon village. "They seem to love the ambiance here. Many come at sunset and spend almost the evening here. Others come early in the morning, and take a boat ride on the marsh or watch local fishermen returning to the shore with their catch. "I have also seen people stay the whole day here to avoid the city's summer heat." Authorities of Phu An Commune, which administers the village and the Chuon and Sam marshes, have allowed seven restaurants and eateries to operate, and these serve around 1,000 customers during summer days. 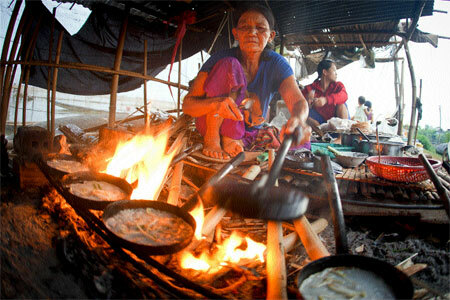 Hot cakes: The kinh fish pancake is a big draw for visitors. Visitors drawn to the village by the sunrise and sunsets often stay on to enjoy local food. "Food here is fresh, delicious and cheap," said Le The Thuy An, a Da Nang native working in Hue City. She comes from coastal city and gets the chance to taste a variety of seafood, so she can vouch for food from the lagoon. "This is the best choice in Hue for weekends. Coming here helps me recover from hardworking weeks." Other customers who rave about the food, with some saying it is among the best in the country, attribute this to the low salt in the brackish waters compared with water in the ocean. Apart from the shrimp and crabs, several kinds of fish, including ca mu (Serranidae), ca dia (Siganus) and an endemic fish species named ca kinh. The lagoon's kinh fish has made the famous Hue pancake even more special, replacing the usual stuffing of shrimp, meat and bean sprouts to give it a very different taste. "Many of my friends are eager to come here early in the morning because of the pancake," said Vu. "I can say that you can't get a better pancake than this in the country." Served hot on fires lit on the lagoon shore, the food is a mouth-watering sight. Customers can also buy the fish from fishermen have just returned and have it cooked by the pancake sellers. However, despite its scenic and culinary attractions, the village receives few foreign visitors. Travel agents say the locality's weak garbage management is dirtying and polluting the lagoon with floating waste. "Everything is good for lagoon tours if the rubbish is collected properly," said Bao Huy, a local tourist guide. Several media reports have recently highlighted the village as a new destination in Hue, mentioning its "unique" communal house that is said to commemorate a female founder of the village, which is rare. But researcher Ho Tan Phan said there was no record to prove this. "The lagoon area includes the two marshes of Chuon and Sam. The Chuon marsh is attached to Chuon or An Truyen village and the Sam is part of Sam or My Lam village. he said. "Chuon is more well-known among the academic community because four famous mandarins under the Nguyen Dynasty (1802-1945) were natives of the village."